Analysis: Doctson was dealing with an illness this past week, but he bounced back to co-lead the Redskins in receptions and lead the team in receiving yardage. The 26-year-old did manage to establish new career highs in receptions (44) and receiving yardage (532) in 2018, but he's still largely considered a disappointment after being selected No. 22 overall in 2016. Doctson will be playing on the final year of his rookie contract in 2019, and it remains to be seen if he'll stick around to fulfill it. Analysis: Held out of practice Thursday and Friday due to an illness, Doctson has put the ailment behind him as he prepares for his typical workload in the range of 77 to nearly 100 percent of the offensive snaps. The usage hasn't translated to many significant game lines this season, but he is just four yards shy of setting a new career high. Analysis: Doctson still has time to recover before Sunday, but it isn't a great sign that he missed practice both Thursday and Friday, per Kareem Copeland of The Washington Post. With fellow wide receiver Maurice Harris (concussion) already ruled out, Michael Floyd may be looking at a three-down role on the outside. It's unclear whether Jehu Chesson or Darvin Kidsy would join Floyd and Jamison Crowder in three-wide formations if Doctson were to miss the game. Analysis: Doctson joins two other Redskins wideouts that were listed on Wednesday's injury report: Jamison Crowder (who was limited by a wrist issue) and Maurice Harris (who didn't practice due to a concussion). With the top trio all question marks at the moment, the remaining healthy options at the position in Washington are Michael Floyd, Jehu Chesson and Darvin Kidsey. 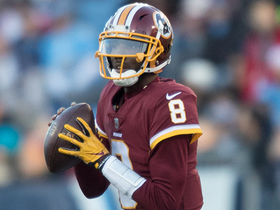 Analysis: Josh Johnson failed to connect with Doctson on multiple occasions, most notably a bad throw into coverage in the first half that was picked off. It is tough to trust any receivers outside of Jamison Crowder with an inaccurate mobile quarterback under center. Doctson does possess big-play ability, but he is nothing more than a deep-league dart against the Eagles in Week 17. Doctson (lower back) is active for Saturday's contest against the Titans. Doctson (lower back) is listed as questionable for Saturday's contest at Tennessee. Analysis: Doctson's practice reps weren't impacted Tuesday or Wednesday, but the Redskins tacked him onto Thursday's report with what was termed lower back spasms. Elsewhere in the receiving corps, tight end Jordan Reed (foot/ankle) has been ruled out, and Vernon Davis and Maurice Harris are questionable for Saturday with concussions. If Doctson gets the all-clear this weekend, he would be primed to take advantage of the situation alongside Jamison Crowder and Jeremy Sprinkle. Doctson was held without a catch on two targets in Sunday's 16-13 win over the Jaguars. Analysis: Listed as questionable due to a concussion, Doctson got the start but didn't make any noise. 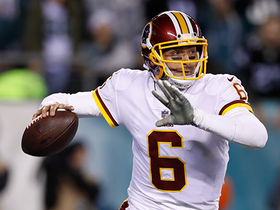 He was coming off three straight games with more than 50 yards, but there isn't much reason to expect success with Josh Johnson under center for Week 16 against the Titans and Week 17 against the Eagles. Doctson (concussion) is listed as active Sunday in Jacksonville. Analysis: Doctson passed through the concussion protocol in short order, setting himself up to face the Jags' second-ranked pass defense. He'll be on the receiving end of passes from Josh Johnson in an offense without Jordan Reed (toe). Doctson (concussion), who is listed as questionable for Sunday's game against the Jaguars, traveled with the team to Jacksonville, John Keim of ESPN.com reports. Analysis: The news confirms that Doctson has at least some hope of receiving clearance from the NFL's concussion protocol prior to the 1 p.m. EST kickoff. Doctson only practiced once this week, but since he was a full participant in Friday's session, he shouldn't face any restrictions Sunday if he does in fact receive the green light to play. Doctson (concussion) is listed as questionable for Sunday's game at Jacksonville, John Keim of ESPN.com reports. Analysis: Doctson returned to practice Friday and seemingly has a shot to make it through the concussion protocol before Sunday's game. If he does, he'll square off against Jaguars cornerbacks Jalen Ramsey and A.J. Bouye while catching passes from veteran journeyman Josh Johnson. Doctson (concussion) returned to practice Friday, JP Finlay of NBC Sports Washington reports. Analysis: While still likely to have a designation on the final injury report, Doctson is at least making a late bid to play in Sunday's game at Jacksonville. He didn't practice Wednesday or Thursday. Doctson (concussion) isn't participating in Thursday's practice, John Keim of ESPN.com reports. Doctson (concussion) didn't practice Wednesday, Kareem Copeland of The Washington Post reports. "I think Josh has a chance to be OK [for Sunday's game against the Jaguars]" coach Jay Gruden said. "He's getting checked out by an independent guy and hopefully we'll know more [Thursday.]" Analysis: Doctson entered the concussion protocol in the wake of a Week 14 demolition at the hands of the Giants. Gruden's comments likely indicate Doctson had an evaluation Wednesday to get through one of the five steps in the protocol, but ultimately the wideout will need to gain clearance from an independent neurologist to play this weekend. Doctson (concussion) didn't practice Wednesday, John Keim of ESPN.com reports. Analysis: Doctson still resides in the NFL's in concussion protocol, clouding his status for Sunday's game against the Jaguars. If he's not cleared for the contest, added snaps would available for Maurice Harris and Michael Floyd. Doctson is in the concussion protocol, JP Finlay of NBC Sports Washington reports. 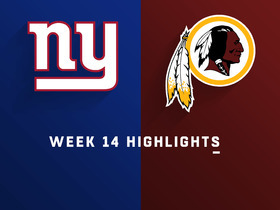 Analysis: Doctson caught four of five targets for a career-high 84 yards in Sunday's 40-16 loss to the Giants, unexpectedly having one of his better games with Mark Sanchez and Josh Johnson taking snaps. The third-year wideout apparently got concussed somewhere along the way, putting his availability into question for Week 15 at Jacksonville. Maurice Harris and Michael Floyd would be the top candidates to take on vacated snaps, albeit in a nightmare matchup with Johnson under center. Doctson (hip) caught four of five targets for 84 yards in Sunday's 40-16 loss to the Giants. Analysis: This was a strong performance from Doctson, especially considering his team trailed 40-0 through three quarters. The 84 receiving yards marked a season high, but Doctson will be hard-pressed to match that total against the Jaguars in Week 15. Josh Johnson will start that game under center for the Redskins after replacing an ineffective Mark Sanchez in this one, but Doctson might have to match up with Jaguars CB Jalen Ramsey. Doctson (hip) is listed as active Sunday against the Giants, Kareem Copeland of The Washington Post reports. Doctson is listed as questionable for Sunday's game against the Giants due to a hip injury. 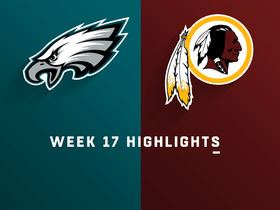 Doctson caught three of five targets for 51 yards in Monday night's 28-13 loss to the Eagles. Doctson caught six of 10 targets for 66 yards in Thursday's 31-21 loss to the Cowboys. 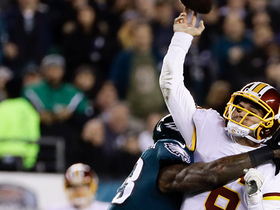 Analysis: The 2016 first-round pick hit season-high marks for receptions, targets and yards, finally taking advantage of his regular role in the Washington offense. 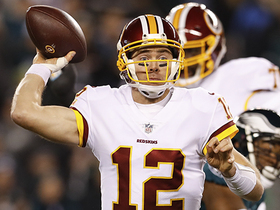 He seems to offer more upside with Colt McCoy under center, as Alex Smith (leg) showed little interest in pushing the ball downfield to wide receivers. Doctson gets a favorable matchup Week 13 against the Eagles on Monday Night Football, facing a secondary that's been ravaged by injuries all season. Doctson turned seven targets into three catches for 32 yards in Sunday's 23-21 loss to Houston. Analysis: Doctson has three or more catches in each of his last eight games, but he's yet to eclipse the 50-yard mark in a game this season. This performance snapped a two-game touchdown streak, but those were Doctson's only two scores of the season, so starting another run against the Cowboys in Week 12 won't be easy. Doctson's outlook also took a major hit in this one when quarterback Alex Smith broke his leg, leaving backup Colt McCoy in charge of the offense. Doctson caught all four of his targets for 46 yards and a touchdown during Sunday's 16-3 win over Tampa Bay. Doctson caught three of six targets for 31 yards and a touchdown in Sunday's 38-14 loss to the Falcons. Doctson caught five passes for 49 yards on five targets in Sunday's 20-13 win over the Giants. Analysis: Doctson established season-high marks for catches and yards, but he still doesn't offer much in terms of either volume or efficiency. Even a Week 9 matchup against the Falcons isn't enough to inspire confidence. Doctson caught three of six targets for 42 yards during Sunday's 20-17 win over the Cowboys. Doctson caught three of six targets for 20 yards in Sunday's 23-17 win over Carolina. Analysis: Doctson returned from a one-game absence caused by a heel injury to lead all Redskins wideouts in both targets and snaps (84 percent). His consistent playing time still isn't translating into production, with Doctson catching just eight of 19 targets for 68 yards on 247 snaps this season. Washington will play host to the Cowboys in Week 7. Doctson (heel) is listed as active Sunday against the Panthers. Analysis: After taking a seat last Monday in New Orleans, Doctson hasn't actually seen the field since Week 3. Expect Doctson to benefit from the dual absences of Jamison Crowder (ankle) and Chris Thompson (ribs/knee), though Paul Richardson and Jordan Reed are the most reliable options to Alex Smith and the Redskins' passing attack Sunday. Doctson (heel) is listed as questionable and being treated as a game-time decision Sunday against the Panthers, John Keim of ESPN.com reports. Doctson (heel) was a limited participant at Wednesday's walk-through practice. Coach Jay Gruden said Tuesday that he anticipates Doctson (heel) will play Week 6 against the Panthers, Tarik El-Bashir of The Athletic reports. Doctson (heel) is inactive for Monday's contest at New Orleans. Analysis: In the wake of the Redskins' Week 4 bye, Doctson was absent from practice due to a bruised heel, placing a cloud over his potential to play Week 5. During pregame warmups, he took part in agility drills and worked on coming off the line of scrimmage, per John Keim of ESPN.com. Doctson apparently didn't pass the eye test of the team's training staff, which should give Maurice Harris an opportunity to enter the starting lineup, according to JP Finlay of NBC Sports Washington. Doctson (heel) is walking around without a protective boot or a noticeable limp Monday afternoon, JP Finlay of NBC Sports Washington reports. Analysis: Listed as a non-participant throughout the week of practice, Doctson is considered a game-time decision for Monday's matchup with the Saints. His ability to walk around unencumbered doesn't mean he'll be able to play, but it's at least a good sign that he'll give it a shot during pregame warmups. Maurice Harris will step in as the No. 3 receiver if Doctson is held out. Doctson (heel) did not participate in Saturday's practice and is listed as questionable for Monday's game against the Saints, Kareem Copeland of the Washington Post reports. Analysis: Doctson has yet to log a practice session this week, which is not good news for his Week 5 availability. If the 25-year-old wideout ultimately does not suit up, Maurice Harris is in line to start along with Paul Richardson and Jamison Crowder. Doctson (heel) missed another practice Friday and could be unavailable for Monday's game in New Orleans, John Keim of ESPN.com reports. Analysis: Doctson initially hurt his heel prior to a Week 4 bye, then aggravated the injury when someone stepped on his foot during Wednesday's practice. The early signs aren't too encouraging, as he was unable to practice Thursday and spotted in a protective boot Friday, per JP Finlay of NBC Sports Washington. Maurice Harris likely would step in as Washington's No. 3 wide receiver if Doctson were to end up on the inactive list Monday. Coach Jay Gruden said Thursday that Doctson is "day-to-day" due to a bruised heel, John Keim of ESPN.com reports. Analysis: Doctson departed Wednesday's unofficial session early after his heel was kicked, forcing him to focus on rehab rather than practice Thursday. He'll have two more sessions to prove his health this week in advance of Monday's contest at New Orleans. Doctson (heel) didn't practice Thursday, John Keim of ESPN.com reports. Analysis: The Redskins held an unofficial practice Wednesday but didn't leave it without a casualty of sorts. According to Keim, Doctson's heel was stepped on, which is the reason for Thursday's absence. While coach Jay Gruden is expected to touch on Doctson's health during a media session Thursday, the wide receiver appears to be a question mark for Monday's game in New Orleans. Doctson wasn't present for practice Wednesday due to an apparent heel injury, John Keim of ESPN.com reports. Analysis: Doctson has reportedly been nursing the injury since the Redskins' Week 3 win over the Packers, when his heel was stepped on at some point during the action. He benefited from a Week 4 bye to recover from the issue, but it's unclear where he currently stands in his recovery. The Redskins will release their first official injury report of the week Thursday, which should provide more information regarding the 25-year-old's health. Doctson wasn't present for the portion of Wednesday's practice open to the media, John Keim of ESPN.com reports. Analysis: Doctson presumably is dealing with some kind of injury, though nothing was reported heading into the Redskins' Week 4 bye. Washington won't release an official injury report until Thursday, as the team is traveling to New Orleans for a Monday night game in Week 5. Maurice Harris would be the top candidate to join Paul Richardson (shoulder) and Jamison Crowder in three-wideout formations if Doctson were to miss that contest. Doctson was held without a catch on three targets in Sunday's 31-17 win over the Packers. Analysis: Alex Smith threw for 220 yards on just 20 attempts in the comfortable win, directing seven passes to Jordan Reed and four to Jamison Crowder. Despite playing 88 percent of the snaps on offense through three games, Doctson has accounted for just 14 percent of the team target total while catching five of 13 passes for 48 yards. He's now looking at a Week 4 bye, followed by a dream matchup Week 5 in New Orleans. Doctson caught four of seven passes for 37 yards in Sunday's 21-9 loss to the Colts. Doctson caught one of three targets for 11 yards in Sunday's 24-6 win over the Cardinals. Doctson started Friday's preseason game against the Broncos, but he didn't draw any targets. Analysis: In Doctson's defense, his team used the early portion of Friday's game as a template to evaluate Adrian Peterson, limiting Alex Smith to eight pass attempts. It's still discouraging to see Doctson held off the stat sheet, especially after he drew just one target (an 11-yard catch) in last week's preseason game against the Jets. His starting job may not be in doubt, but his target volume is a huge concern. Doctson (shoulder) caught his lone target for 11 yards during Thursday's 15-13 win over the Jets in Week 2 of the preseason. Analysis: Doctson caught an 11-yard pass from Alex Smith to convert a 3rd-and-9 on Washington's first possession. The 2016 first-rounder is primed to earn a starting role on the outside this season, so it's nice to see him out there after being held out of the preseason opener. Doctson (shoulder) participated in most of practice Saturday, Rich Tandler of NBC Sports Washington reports. Doctson (shoulder) is taking snaps in 11-on-11 drills at Tuesday's practice, John Keim of ESPN.com reports. Updating a previous report, Doctson (shoulder) did not have his injured heel drained, Kimberley A. Martin of The Washington Post reports. Analysis: Head coach Jay Gruden confirmed the report of Doctson's heel being drained was not true. Still, the 25-year-old receiver has endured a tough start to training camp, as he began with an MRI on his leg followed by a shoulder injury. The Redskins may exercise caution with him in the foreseeable future in order to avoid lingering issues heading into the season. 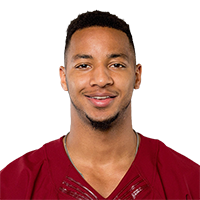 Doctson (shoulder) underwent draining of his heel earlier this week, Brian Mitchell of NBC Sports Washington reports. Doctson (shoulder) will sit out Thursday's practice but is expected to return to action by Saturday, Rich Tandler of NBC Sports reports. Analysis: Doctson took a scary fall during Wednesday's practice, and while there may have been some concern about a possible collarbone injury, it turns out he escaped with an AC joint sprain. Head coach Jay Gruden cleared that up when speaking to the media Thursday, saying "everything checked out fine." It appears Doctson has dodged a bullet here, as his absence is expected to be measured in a matter of days as opposed to weeks. Doctson (shoulder) is believed to have suffered an AC joint sprain during Wednesday's practice, Ian Rapoport of NFL Network reports. Analysis: There may have been some concern about a broken collarbone after Doctson took a hard fall on his shoulder, but it appears he escaped the incident with a less severe injury. He still could miss some practice time and might even be in danger of missing the preseason opener, depending on the severity of the sprain. The Redskins plan to provide another update Thursday after testing on Doctson's shoulder is finished. Doctson will be evaluated Wednesday for a possible shoulder injury. Analysis: Per John Keim of ESPN.com, Doctson was favoring his left arm after he hit the ground hard on a catch attempt at Wednesday's practice. He left the session early to get attention from the training staff and the Redskins expect to have another update Thursday. The 25-year-old is slated to open the season with a regular spot in three-receiver formations, so a serious injury would open the door for Maurice Harris, Trey Quinn or Robert Davis to get consistent snaps. While he acknowledged it will be difficult for Doctson to put up big numbers, coach Jay Gruden did say he expects the third-year wideout to be dangerous in the red zone, John Keim of ESPN.com reports. Doctson recently had an MRI on his leg, but he's expected to be a full participant for the start of training camp, Mike Jones of USA Today reports. Analysis: The Redskins said the MRI was precautionary, and it apparently didn't reveal anything too troubling. Doctson had his rookie campaign derailed by a heel injury, but he bounced back to play all 16 games last season, setting him up for a regular role in three-wide formations in 2018. He and Paul Richardson will serve as Alex Smith's top downfield targets, while Jamison Crowder, Jordan Reed, Vernon Davis and Chris Thompson are expected to absorb most of the looks in the short passing game. Redskins coach Jay Gruden said Doctson will have more opportunities to make plays on 50-50 throws this upcoming season, Rich Tandler of NBC Sports Washington reports. Doctson, who hauled in four of his 10 targets for 37 yards in Week 17's loss to the Giants, ended the season with 35 receptions for 502 yards and six touchdowns in 16 games. Analysis: Perhaps the best stat for the second-year pro was the fact that he played in every single contest this season after only playing in two games his rookie year due to a torn Achilles. Although he wasn't as involved to start the year, Doctson emerged as a solid No. 2 option on the depth chart for the Redskins after Terrelle Pryor failed to live up to expectations. The 6-2 wideout provided the Redskins with a big target in the red zone, as his six touchdown receptions led the team. Doctson caught two of 13 passes for 61 yards and a touchdown during Sunday's 27-11 victory over the Broncos. 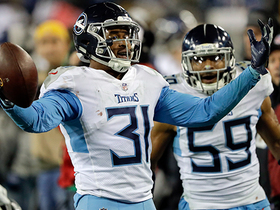 Docston caught two of four passes for 18 yards in Sunday's 20-15 win over the Cardinals. Analysis: Doctson was almost nonexistent all afternoon, as his most notable play was actually a 14-yard loss on a failed end-around late in the third quarter. The second-year wideout will look to bounce back Sunday against a stingy Broncos passing defense. Doctson brought in three of six targets for 34 yards in Sunday's 30-13 loss to the Chargers. Doctson brought in three of five targets for 26 yards and a touchdown in Thursday's 38-14 loss to the Cowboys. Doctson turned four targets into two receptions, 28 yards and a touchdown Thursday against the Giants. Analysis: Offense was tough to come by for both teams throughout most of the evening, but Doctson salvaged his game with a touchdown reception mid-way through the fourth quarter and gave Redskins the lead. It was the 24-year-old's fourth trip to the end zone this season and first time since Week 8. He will seek to start a streak when the Giants face the Cowboys in Week 13. Doctson turned seven targets into four catches for 81 yards in Sunday's 34-31 overtime loss to the Saints. 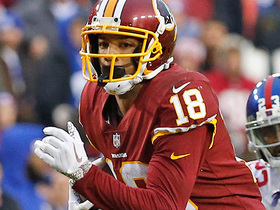 Analysis: Doctson's promotion to a starting wide receiver role at Terrelle Pryor's expense has led to an increase in targets, as he's tied his career high with seven in each of the past two weeks while picking up a career-best 81 receiving yards in this one. The 2016 first-rounder out of TCU has had to battle through injuries in the early stages of his career, but Docton's big-play ability gives him serious upside now that he's playing a sizable role. Doctson, who played a season-high 69 offensive snaps and drew seven targets in the Redskins' Week 10 loss to the Vikings, could be in store for a similarly high workload in Sunday's game against the Saints, Master Tesfatsion of The Washington Post reports. Doctson is one of just three healthy wide receivers for the Redskins ahead of Sunday's game in New Orleans, Master Tesfatsion of The Washington Post reports. Analysis: Maurice Harris is the one who really stands to benefit, as Doctson already has a four-game streak logging at least 79.7 percent of the offensive snaps. The 2016 first-round pick has struggled to turn playing time into consistent production, and he'll draw a touch matchup Sunday against the Saints' breakout cornerback duo of Marshon Lattimore and Ken Crawley. Doctson hauled in four of his seven targets for 30 yards in Sunday's loss to the Vikings. Analysis: Doctson's four receptions marked a new season high, as the wideout continues to see growth in the offense following Terrelle Pryor's struggles. Although his numbers Sunday weren't spectacular, Doctson did see the most offensive snaps (69) of any Washington wideout. He'll now be tasked with going up against a hard-nosed Saints secondary, which is allowing the seventh-fewest passing yards per game in the league this season. Doctson caught three of five pass attempts for 59 yards in Sunday's win 17-14 win over Seattle. 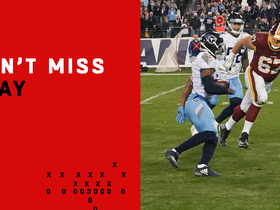 Analysis: Doctson almost had a much bigger day as he was ruled down at the half-yard line after his 38-yard catch set up the game-winning score. The newly-minted starter was the third most-targeted pass catcher for the Redskins behind Vernon Davis (nine) and Chris Thompson (six). But with Davis injuring his hand and Jordan Reed and Jamison Crowder both still possibly nursing hamstring injuries, Doctson could be on tap for an even bigger role in Week 10's matchup with Minnesota. Washington Redskins quarterback Josh Johnson rolls to his right and throws a dart across the middle to wide receiver Josh Doctson to keep the drive alive. 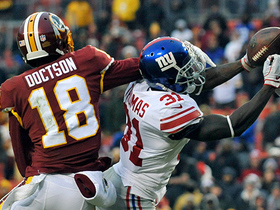 New York Giants safety Michael Thomas undercuts the route to pick off Washington Redskins quarterback Josh Johnson. Washington Redskins quarterback Mark Sanchez throws an incomplete pass to wide receiver Michael Floyd. Washington Redskins quarterback Mark Sanchez passes to wide receiver Josh Doctson for 20 yards.